Back by popular demand and a few bribes, I give you more Ines Sainz. Hot off the presses (and from a few stolen cameras) are some new Super Bowl pictures. 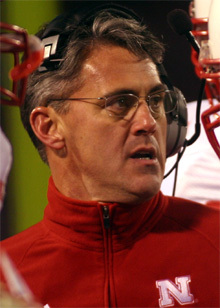 I have always thought that Trev was the best college football analyst I have seen on ESPN – regardless of our Husker bias. Kirk Herbstreit is considered the face of college football right now in the broadcast world. Ask yourself this. Who is better television – Alberts or Herbstreit? Alberts or Lou Holtz? Alberts or Mark May? Actually, the best of the bunch might be ‘fake’ Lou Holtz giving a Nebraska/USC pep talk here – hilarious. After Trev was fired for not showing up to ESPN one Sunday morning, he has disappeared into anonymity from the college football world. Until now. Trev fires back at great blog everydayshouldbesaturday (EDSBS) after he was ripped apart. Here he is…. The Trevvie, front and center!!! Nicely done. What next? SNL? The Tonight Show? KFAB? Today we got word that current UNO and former Papillion-La Vista High School QB Steve Heiman is leaving the Mavs to join Nebraska as a walk-on. Heiman joins a growing list of players overlooked by Callahan and Co. that have decided to return to Nebraska as a walk-on. Previously former Lincoln East quarterback Jim Ebke and former Fremont wide receiver Matt Donahue also gave up scholarships at their respective schools to walk-on at NU. Ebke was playing for Division I-AA South Dakota State, while Donahue was a “Fighting Frankie Solich” at Ohio. While I’m not one to blame the demise of the Huskers completely on a supposed lack of walk-ons under the previous regime, these are important additions nonetheless. Never underestimate the importance of these homegrown Huskers and the pride they have for playing for Nebraska. These are the guys that push the starters everyday for any chance to contribute. The guys that get bruised and bloodied on special teams for the opportunity to perhaps wind up in the box score. These are also the guys that stand up in team meetings and remind them of the meaning associated with the “N” on their helmets, as Thomas Rice did after the team’s 41-6 loss to Missouri. “I got up and said, ‘I don’t know if you guys realize this, but there are a million-and-a-half people who care about this program. And they want to see you do well, ” Rice said, describing his heartfelt speech to teammates. That’s really the bottom line. The whole “I play for Nebraska” schtick is supposed to be more than a cheesy tagline. It was meant to be a STATE of mind. A constant reminder of 1.7 million people who ache over every dropped pass and cringe at every blowout loss. Thankfully the new group of walk-ons seem to have an intimate understanding of this. Coach Osborne told us himself if you’re a five-star recruit or a recruited walk-on, no one is different,” [2008 walk-on Omaha Bryan’s Jeremy Wallace] said. “You make your name on the field. I know I’m going in there with a chip on my shoulder. Just some random thoughts on a few things related to Nebraska football. 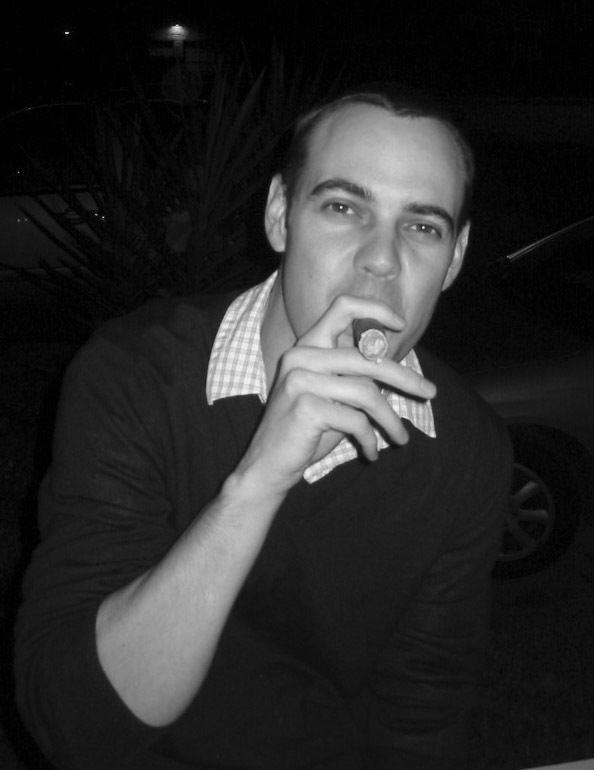 · First, I’m ecstatic we held onto Shawn Watson for the meantime. I’m excited to see what he can do with some of the talent I think we have on the offensive side of the ball. One thing that sticks out to me is how much he has talked up our offensive line in recent months. I hope to maybe take a closer look at some of his offenses at Colorado before the season starts. · Nebraska also scored its first big recruiting win of the Pelini era by regaining the commitment of Will Compton over Illinois and Mizzou (sorry BigHead). We needed linebackers in this class and Compton could potentially see the field early if he lives up to the hype. · This weekend the Huskers bring in another big group of recruits for official visits. I’d love to get both guys from Louisiana and all of the WR prospects look pretty legit (especially the film on Kenny Stafford…why the crummy offer list?). Another guy to watch out of the group is Courtney Osborne – he also has some pretty impressive film floating around there. · Slightly unrelated but have any of you been watching the Senior Bowl practices on the NFL Network? I had a lot of time on my hands this week and I watched almost all of the coverage. I was really fascinated by it all, especially the verbiage and techniques the NFL coaching staffs throw at the guys. Talk about an adjustment. · I have a new favorite assistant coach – Mike Ekeler. The guy showed up for the coaches’ in home visit with Will Compton with a semi-permanent tattoo of Will’s name on his body. Ekeler’s energy levels are also said to rival those of Will “Boom Motherf*cker” Muschamp. The LJS cites the ever present “sources” in noting that Shawn Watson will turn down Nick Saban and stick around Lincoln. “Alabama head coach Nick Saban sought to have Watson fly there Tuesday, but Watson declined the invitation and said he was planning to remain as NU’s offensive coordinator, according to one source. According to another source close to Watson, the coach received an offer for the Alabama job on Monday night. So we can all relax…or can we? Any chance this “source” might be Watson’s agent? At any rate, we need to lock this guy up. The Alabama Rivals site is reporting that Shawn Watson will interview for the open Offensive Coordinator position at Alabama. This is bad for several reasons. First, Watson is crucial to maintaining some continuity in the offense under Pelini. Secondly, this is a pretty important time in terms of recruiting. Even rumors of coaching departures can have huge ramifications this late in the game. Some how, some way, Texas and Mack Brown are going to perhaps find a way to f*ck us on this one. Remember it was Major Applewhite’s return to Austin that opened up the job under Saban. And to think I just got my Mack Brown for President T-shirt a couple of weeks ago for birthday. I had the last of my interviews today, so that ridiculous process is finally over. They seemed to go really well overall, but it’s tough to really know what they’re looking for. Now I sit back and wait to find out where I end up. Unfortunately that won’t happen until Match Day on February 25th. So in the meantime, I hope to be able to devote some more time to DXP. Speaking of which the J.E.T.S – Jets, Jets, Jets hired you know who as their running game coordinator(?). I have no idea what they saw in Callahan’s stretch play right, stretch play left rushing attack, but I wish them all the best. After much speculation, Marlon Lucky will apparently return for his senior season in 2008. This is huge news for Nebraska fans and I have to admit that I’m surprised by the move. I certainly think it was the correct decision by Lucky, but with rampant reports of Lucky’s unhappiness in Lincoln, I wrongly assumed he would quickly bolt for the NFL. 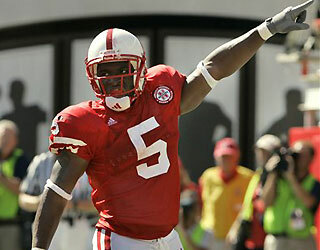 But whatever the reason, Nebraska fans need to celebrate Lucky’s return. Although many have argued he’s failed to live up to expectations (myself included), he has put up some impressive numbers when given the chance. Marlon broke the 1000 yard mark rushing the ball a year ago and also put up over 700 yards receiving. In addition, Lucky finished 2nd in the Big 12 and 13th nationally with 143.7 yards from scrimmage per game in 2007. In all Lucky averaged 6.1 yards per play and an impressive 11.75 yards per touch on 3rd down. That’s a pretty money stat right there and gives Nebraska’s offense a lot to build on in 2008. Now we’ll just wait and see how Shawn Watson plans to use Lucky next season. 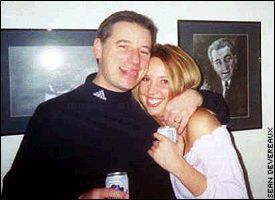 Not that Pelini was “allegedly” out drinkin’ on Bourbon Street (Cheers! ), but that he’s actually an Indians fan. He’s clearly gone off the reservation in this photo. Anyway, the picture is definitely making the rounds. “i think it is fake, the face is too big and if you look the edging of the face and neckline is not smooth and are different colors. If you look on the right of the face, the person in the photo’s left ear, you can see clearly that this is not the original face of the person in the photo. Also the way the chin of the person is almost touching the shirt does not make sense in the photo. If a person has their head turned then the shirt would not be that close to the chin, nor would the shirt have no folds in it. The original IMO was looking forward and not at the camera. Also look at the shadow. If the wall is that far behind the person in the photo, then the shadow should not be a direct left drop shadow. It should be lower as the angle of the camera is down and it would not be as strong of a shadow as the wall is so far behind them. This is a basic example of a drop shadow photo manipulation with smoothness added to the edges. I don’t know, that’s quite the analysis, but in the end, who cares? Dr. Tom? Mary Pat? 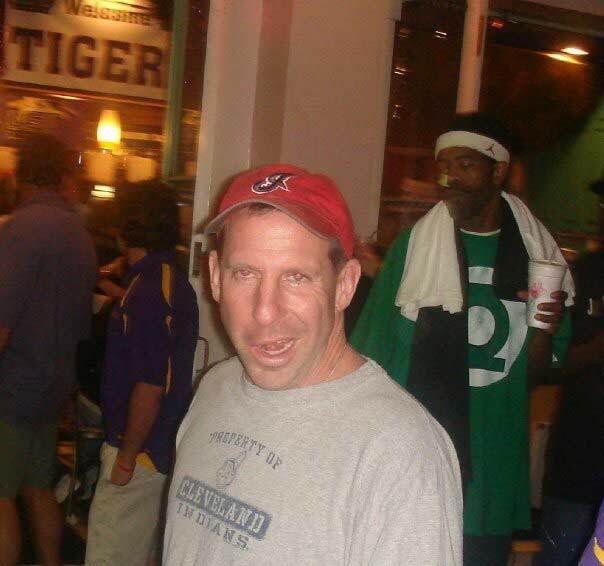 If legit, Pelini joins the likes of Larry Eustachy, Mike Price, and obviously Frank Solich as founding members of the Drunken Coaches Association of America. In other news Bob Devaney just rolled over in his grave…and smiled. I have to admit that I’m at least partially responsible for the low television ratings this year’s bowl games produced. However, like the average AP voter not watching the games won’t prevent me from submitting a ballot. Have at it folks. You are currently browsing the Sammyvegas's Blog blog archives for January, 2008.